Join us for the 7th (!!) annual Grainne Ale Craft Beer festival taking place in the best beer garden in Ireland. It will all be happening orn the Saturday and Sunday of the May Bank Holiday weekend in Gracy’s Pizzeria & Bistro in the farmyard of Westport House. This year, we welcome back old favourites and our regulars – Mescan, Reel Deel, Longueville House and Black Donkey. 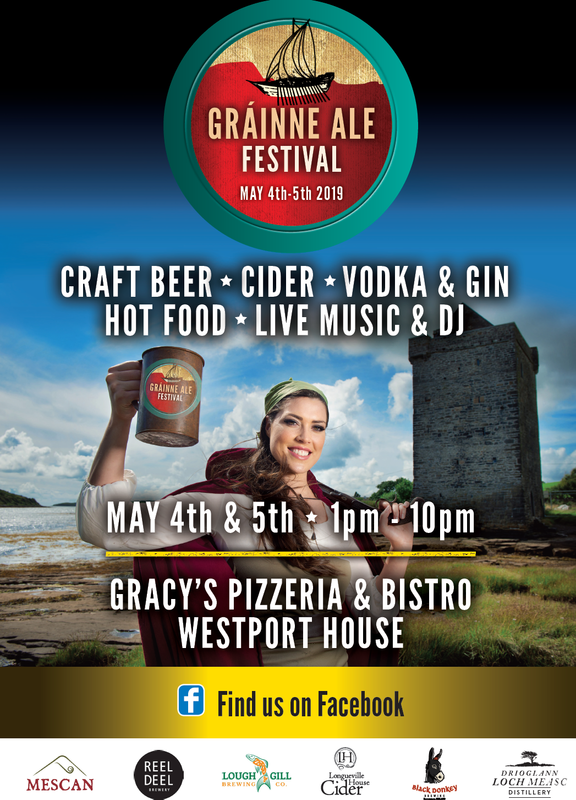 And for their first time at the Grainne Ale, we look forward to sampling Lough Gill’s delicious brew and local Loch Measc distillery’s scrummy vodka and gin. We are beavering away on two full days musical entertainment and will reveal the full schedule in the coming days. And we will be firing up the wood-fired pizza oven for some mouth-watering bites to accompany the robust and flavoursome selections of beers, cider and spirits on offer. As usual, the team at Gracy’s will be serving a full bar and soft drinks to compliment our crafty brews. We hope you’ll come and join us for a tipple and raise a glass to the Pirate Queen herself.